On September 24th, the U.S. Army Corps of Engineers held a change of command ceremony for the Mississippi Valley Division. Brig. Gen. Duke Deluca took over. He is the 37th commander of the division. You can see the Corps’ press release here. One of the important aspects of his job is serving as the president-designee of the Mississippi River Commission. The USACE coordinates with this agency in very important ways that affect us all along the Mississippi. This is an agency that has existed for well over a 100 years and is, in my view, one of the most understudied and least understood federal agencies, particularly given its staggering importance to such a large number of states and localities. 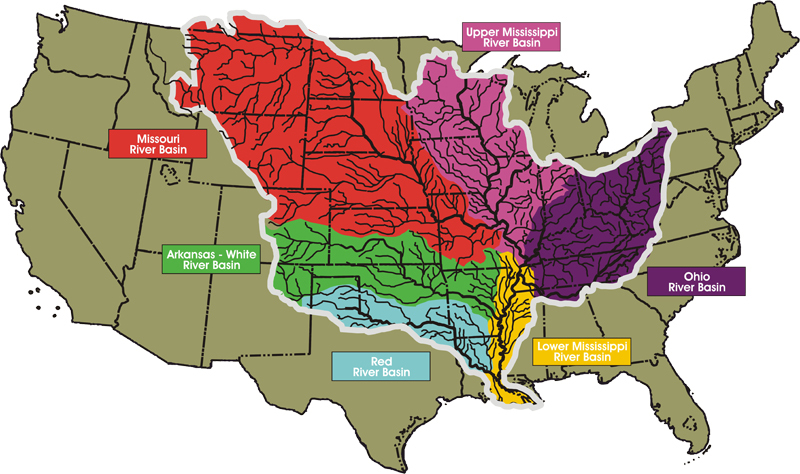 It oversees the Mississippi River and Tributaries flood control and navigation project, providing advice and guidance on issues relating to water resources all along the Mississippi AND its tributaries. If you’re unfamiliar with the MRC, take a look at the map it provides (we reproduced it below) and read through some of the information on its page. That is a large chunk of the country… Good luck, Brig. Gen. Deluca!